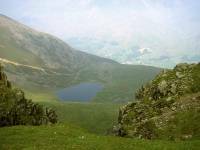 The highlight of my first week of fellwalking, back in 1982 with Mountain Goat holidays. 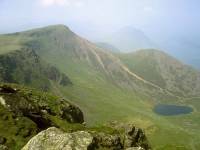 The route started and finished at Buttermere and took in Red Pike, High Stile and High Crags. 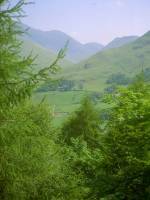 The photo gallery ends on High Stile as a thunderstorm brewed up and we had to retreat down Gamlin End pretty quickly. The day ended with tea and scones at Gatescarth farm. 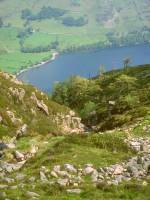 The climb out from Buttermere village took this lovely route through Burtness wood on Buttermere's south shore. The path reaches the thousand foot contour above the wood. 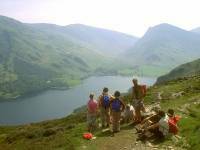 Here we're looking back at Honister Pass across Buttermere. 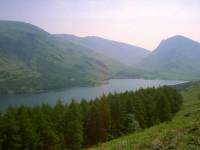 Fleetwith Pike is prominent to the right. 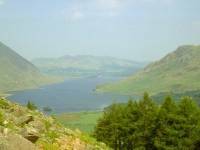 Looking northwest from the same spot along the length of Crummock Water to Lorton Vale beyond. Rannerdale Knotts rises to the right, Mellbreak to the left. Looking back at the start of our climb, 900 ft below. 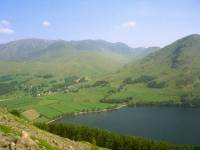 Whiteless Pike stands on the other side of the village, with Grasmoor, Eel Crag and Sail beyond. Robinson is seen to the right. 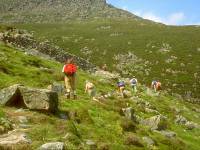 Still one of my favourite shots after eighteen years - the group, with Tim the guide, halts at a bend in the path for a refreshment break. 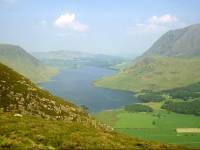 Crummock Water again, seen from the 1500ft contour. 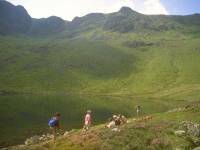 Chapel Crags and White Pike look down on Bleaberry Tarn, where some members of our group stopped for a swim. 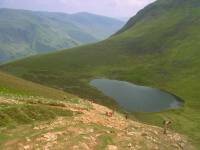 At a height of 1600ft, the tarn is very cold even in high summer. 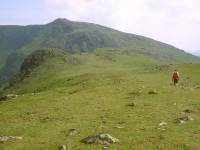 The Saddle is the name of the col between Red Pike and its outlier, Dodd. 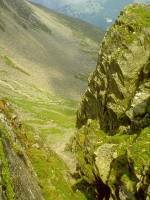 We're at 2100ft and the climb from here to the summit of red Pike is steep and stony. 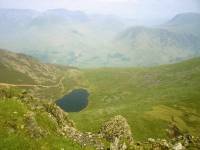 A minor "top" of High Stile, White Pike gives this view of Bleaberry Tarn 700 ft below. 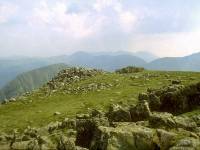 The view southeast from the summit, looking towards the Scafells some five miles away.